From January this year, President Donald Trump has targeted Pakistan on multiple occasions. In a tweet on New Year’s Day, Trump stated, “The US has foolishly given Pakistan more than 33 Billion dollars in aid over the last 15 years, and they have given us nothing but lies and deceit, thinking of our leaders as fools. They give havens to terrorists we hunt in Afghanistan. No more.” After this, all aid to Pakistan came to a halt. Recently, in an interview to Fox TV, Trump defended his government’s decision to stop military aid to Pakistan, stating the country does not ‘do a damn thing’ for the US and its government and had helped al Qaeda leader, Osama Bin Laden hide near its garrison city. He added on Bin Laden, “But living in Pakistan right next to the military academy, everybody in Pakistan knew he was there. And we’re giving them 1.3 billion a year. I ended it because they don’t do anything for us.” With this comment, the Pentagon confirmed that $ 1.66 billion aid to Pakistan has ceased. The battle of words may sound alright, but the reality is vastly different. No Pakistani soldier fought in Afghanistan on the US side. There was no official report of Pakistani soldiers fighting al Qaeda or the Taliban even on their side of the border. Post a strike in August this year by the US in Ghazni, Afghanistan, where over 400 Taliban were killed, there were reports of injured and killed Pakistani nationals, fighting for the Taliban, being brought back. The fact that Pakistan has sheltered the Taliban is more than true. Every drone strike on Pakistani soil was aimed at Taliban located within the country. The term ‘Quetta Shoora’ is used to describe where the Taliban and Haqqani network are located. Sartaj Aziz, the ex-Pakistan foreign affairs advisor had stated in the US that Pakistan has influence over the Taliban and Haqqani network because they reside in the country and some services are provided to them. When Nawaz Sharief warned the Pakistan army chief that support to terror groups operating in neighbouring countries by the nation’s intelligence agencies and the army were coming under international scrutiny, he was unceremoniously removed. This was the crux of the ‘Dawn Leaks’. This support had also been admitted by Parvez Musharraf. The only elements that the Pakistan army has acted against in its ‘war on terror’ have been those which are its own creation. Their army attacking the Lal Masjid in July 2007 was their biggest mistake and led to the creation of terrorist organizations which it continues to battle. The attack killed 100 students in a seminary which fed the Taliban and al Qaeda. Al Qaeda leaders responded by calling for revenge and declared an all-out war against the Pakistani army. Within a year there were 88 bombings which killed almost 2,000 and injured over 3,000 Pakistanis. The first suicide attack took place within two months of the Lal Masjid incident in the unit lines of the special forces unit which attacked the mosque, leaving 22 soldiers dead. For the first time in Pakistan’s history, military personnel and installations in high-security zones were targeted. Till the Lal Masjid episode, various Taliban groups operated independently in their own regions. Six months after the storming, 40 militant leaders commanding thousands of fighters gathered in South Waziristan to form a united front under the banner of Tehreek-i-Taliban Pakistan (TTP), the group the Pakistan army has been battling since. Its policy of brutality and inhuman treatment to locals in Baluchistan led to the creation of the Baluch Liberation Army (BLA). It was this force which attacked the Chinese Consulate in Karachi last weekend. This is the other group which the Pakistan army battles. Hence, Pakistan has neither contributed or participated in the ‘war on terror’. It is only battling forces which its own flawed policies created. The TTP and BLA are neither involved in Afghanistan nor are contributing to the Afghan Taliban. They are challenging the Pakistan army. On the contrary, hoping to secure support from Pakistan, US drone strikes have struck TTP leaders hiding in Afghanistan, an action which the Pakistan army has never reciprocated against the Taliban. The only hold that Pakistan has and would continue to have over the US is the provision of Karachi port for supplies and its road space for movement of stores and air space for air and drone strikes. The fact remains that Pakistan considers Afghanistan as its backyard and is hopeful of the Taliban coming to power someday. Therefore, it would never risk angering them by either strikes or arrests. 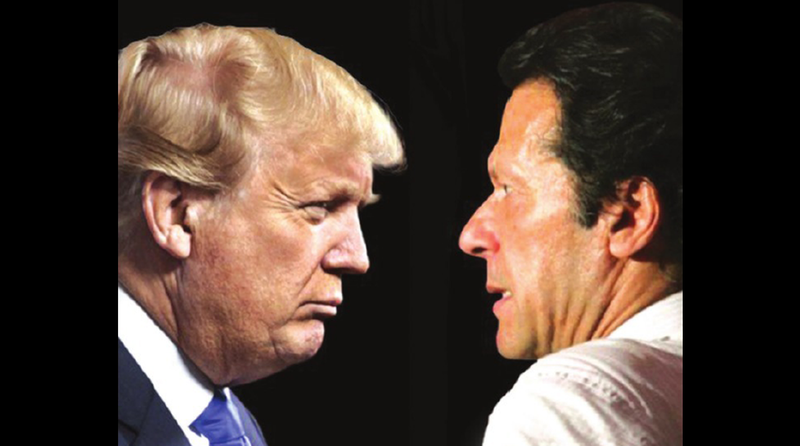 Imran Khan and General Bajwa are only seeking internal support, fully aware that Donald Trump’s words are true.